Old-growth Taxodium distichum in Four Holes Swamp, South Carolina, home to the oldest documented baldcypress in SC. Taxodium distichum is among the most long-lived species in eastern North America. 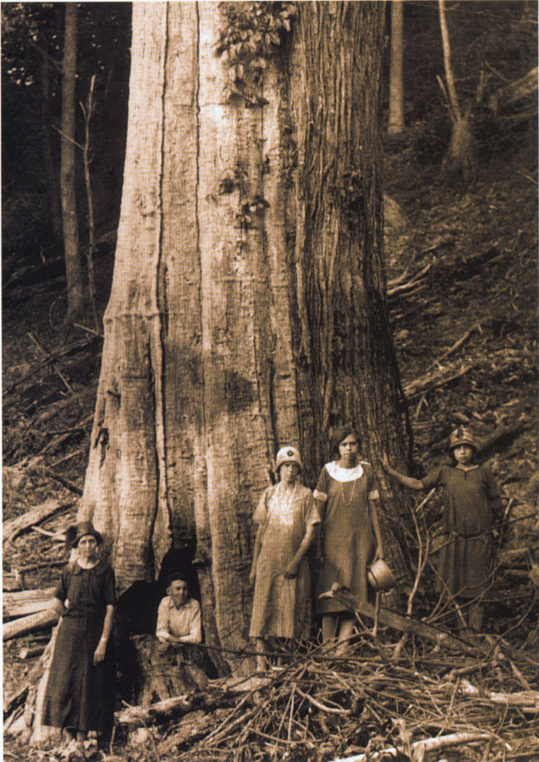 One tree in eastern North Carolina is known to have lived at least 1622 yrs. Note: these ages are derived from coring above a baldcypress' basal flare. Eastern OLDLIST is a 'franchise' database of OLDLIST, a database of ancient trees and their ages. The purpose of this list is to identify and highlight maximum ages for species in eastern North America. This list will contain only well-verified or well-documentsd tree ages (see Technical Information below for further information). The oldest trees world-wide are typically conifers living in extreme environments (arid to semi-arid or elevational/latitudinal treelines, of whichthe oldest-known tree in the world, Pinus longaeva, lives in a combination of these extreme environments (Schulman, 1954)). Eastern North America is generally warm and moist and dominated by broadleaf species. Maximum tree ages in this region are often much less than other regions (though see ages for Thuja occidentalis, Taxodium distichum and Juniperus virginiana). As a result, maximum ages in this diverse and mostly temperate environment are often overlooked. These pages are intended to inform scientists, naturalists and general dendrophiles [otherwise known as druids]. Other than roughly ten to twenty main species in eastern North America, it can be argued that little is known about species longevity and persistence in the forest within the region (Pederson et al., 2007). Undoubtedly there are great things and surprises to be learned in these less-well studied species; just check out the maximum age of Nyssa sylvatica!!! We would like to also characterize the distribution of ages for species across space. In some places, like the Piedmont or Lake Ontario physiographic provinces or places like St. Lawrence and Mississippi Valleys or say, Mississippi, old trees might be hard to come by. Therefore, we especially encourage submissions of tree ages from highly impacted areas where ages might not be near the maximum age for a species. We hope to use this information to deepen our knowledge of these forests and help us predict how forests might change in altered climatic and ecological conditions (see Loehle, 1998; Loehle, 2000; Dayton, 2003; Schmidly 2005). Due to the sheer volume of species in eastern North America, the main page will only list the oldest individual for each species unless there are other trees three years or less younger than the oldest-known. The oldest-known and all others will be listed on a species page so that maximum age in regions, provinces and states can be studied. Similarly, some species, like Picea glauca and Prunus serotina are natually found outside of the region for this database. Therefore, max ages of those within this region will be reported here. For the max age documented across its range, please check the master OLDLIST. One exception is Quercus muehlenbergii. It has populations west of the Great Plains, but has a predominately eastern distribution. In this case, we'll claim it!! At any rate, these pages will be continually evolving. Most of this documentation of tree age listed herewere dereived throughg tree-ring analysis over the last few decades. Crossdated ages are derived through recognized dendrochronological procedures (e.g., Stokes and Smiley 1968; Swetnam, Thompson, and Sutherland 1985; Schweingruber 1987). For a crossdated age, there should be no question of the age of the portion of the tree sampled, except in any portion of the ring series not confidently crossdated with either other trees at the same site or other sites in the area. Ring-counted ages are derived by simple ring counts and may contain errors in age due to missing or false rings, suppressed areas, or other tree-ring anomalies. "Age" in these first two types will invariably be a minimum age rather than true chronological age owing to the difficulty of sampling a tree exactly at the point of germination. Extrapolations are ages derived by regression from age/size relationships (e.g. Stephenson and Demetry 1995) or other mathematical or graphical methods. Ranges of ages derived by extrapolations are welcome and can be accommodated in the database. Some tree ages, such as the Lutheran Theological Seminary scarlet oak in Philadelphiaa, PA, are well-documented through the written record. These historical ages are based upon historical reference to the tree. At present, OLDLIST contains only one historical age, that for Ficus religiosa at a Buddhist Temple in Anuradhapura, Sri Lanka. A continuous historical account of four trees planted there in the 3rd century B.C. has been kept (letter to R.J. Hartesveldt from Ambassador of Sri Lanka in the USA, December 15, 1972). An individual tree may have up to two entries in the database. For example, a tree may have one entry for the age of a crossdated radial increment core and a second for an extrapolation age to a possible pith or germination date. Juniperus virginiana 940 XD -- WV B. Buckley, P. Krusic, E. Cook, Maxwell et al 1, Maxwell et al 2, D'Arrigo et al. 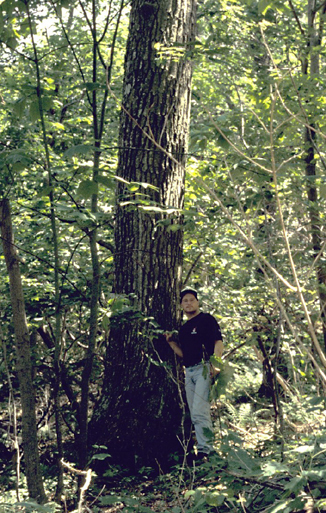 Acer rubrum 300 XD CATB142 Catskill Mtns, NY P. Sheppard & C. Canham; P. Sheppard; Pederson et al., 2007. Pinus pungens 271 XD ---- Pendleton Co., WV A. Hessl, T. Saladyga, et al. © 2013 Rocky Mountain Tree-Ring Research, Inc. & the Tree Ring Laboratory of Lamont-Doherty Earth Observatory and Columbia University - All Rights Reserved.